Standard compliment slips measure 210mm x 99mm. However, if you require a different size then this can easily be produced, usually at no extra cost. If designing your own compliment slip we would recommend leaving a 10mm border from the edge of the paper to the start of your artwork. The bottom margin could be 7mm. This layout will help to maximise the area you need to write on. 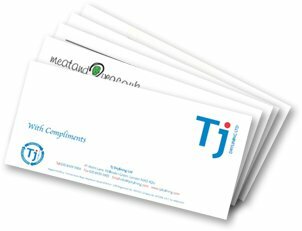 Our standard compliment slip material is a top-quality, 100gsm ultra-white laser Bond. We offer a range of letterhead material including Conqueror. The most popular 'flavour' is brilliant white wove, which is ideal for desktop printers etc. There are quite a few superior alternatives to the Conqueror range, which now carries a small premium. Please Note: we don't cut corners on any of the materials we supply. We use only inkjet/laser-guaranteed materials. Please ask for samples. 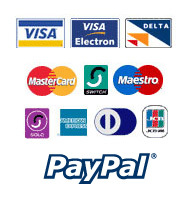 Check with us if you need prices of other combinations.